What Else Can I Expect From an Online Criminal Justice Program? Criminal justice is a broad, multidisciplinary field dedicated to the study of laws and law enforcement. Students explore the historical and sociological motives behind different laws, as well as the various ways that laws are interpreted and enforced at the municipal, state and federal levels. Criminal justice is a common academic pathway for police officers, detectives and other members of the law enforcement community, as well as forensic scientists, criminal psychologists and legal professionals. A bachelor's degree is considered the minimum educational requirement for most criminal justice careers. Many of today's students are choosing to earn online criminal justice degrees. The web-based format is typically more flexible than classroom-based education, enabling students to hold down a job and financially support themselves while they pursue a degree. The best online bachelor's in criminal justice programs feature the same rigorous coursework as traditional brick-and-mortar options. Online criminal justice programs often include internships, as well, which allow students to gain supervised training at police stations, law offices and other real-world workplaces where criminal justice majors tend to find employment. WHAT IS A MAJOR IN CRIMINAL JUSTICE? A criminal justice major explores the foundations of law and law enforcement, as well as the nature of crime and criminal behavior. Read more here..
WHAT KIND OF DEGREE DO YOU NEED TO BE A CRIMINAL PROFILER? A criminal profiler typically needs at least a bachelor's degree in criminal justice, forensic science, forensic psychology, or criminology. Read more here.. Graduates of criminal justice programs can become police officers, detectives, probation officers, forensic scientists, criminal psychologists, and criminal profilers. Read more here.. Yes. There are many criminal justice programs in fully-online or hybrid formats. Read more here.. Applicants must meet all admission requirements in terms of minimum GPA, standardized test scores, and application materials. Following admission, students must fulfill all course requirements and may need to maintain a minimum GPA. Read more here.. Learn more about what you can do with a bachelor's degree in criminal justice and what kind of career opportunities you can look forward to with this comprehensive guide. The best online criminal justice degree programs take a comprehensive approach to the field. Students pursuing a criminal justice degree online will learn about the procedures for creating, modifying and eliminating laws at different jurisdictional levels. They also study the underlying reasons behind criminal behavior, as well as strategies for deterring crime and reintroducing convicted offenders back into society once their prison sentences have ended. WILL AN ONLINE CRIMINAL JUSTICE PROGRAM WORK WITH MY SCHEDULE? Online bachelor's degree programs in criminal justice are usually asynchronous, or self-paced. Students can access lectures and other course materials, submit written assignments, take exams and communicate with their professors on their own time from the comfort of their home computer. Current educational technology also allows them to study on the go using a laptop, tablet, smartphone and other Wi-Fi-compatible devices. For added convenience, online students can typically arrange internships and practicum courses at sites near their current residence, rather than being forced to commute to the community where their campus is located. WHAT JOBS CAN I GET WITH MY BACHELOR'S IN CRIMINAL JUSTICE? Most career pathways in law enforcement are attainable with a bachelor's degree in criminal justice, although additional training is usually required; law enforcement officers must also earn an official commission. Although a doctoral law degree will be needed for those who wish to practice law as attorneys, a bachelor's is generally sufficient for paralegals and other supportive legal personnel. Criminal justice online degrees are also an important step for students who plan to continue their education with a master's program. WHAT ARE THE BEST ONLINE CRIMINAL JUSTICE PROGRAMS? Choosing a program is an incredibly personal decision, and only you can properly evaluate whether a target school's strengths match your educational needs. 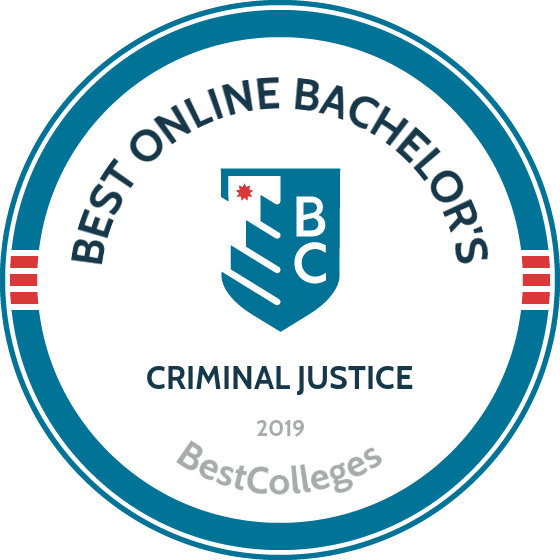 The following ranked list of schools should serve as a helpful starting point in your search for the best online bachelor's in criminal justice programs in the United States. If you are considering an online bachelor's in criminal justice, be sure to contact admissions specialists at different colleges and universities to learn more their about specific bachelor's degree requirements and offerings. Over 80% of the student body at the University of Central Florida takes at least one online or blended-learning course. Through its Center for Distributed Learning, the school offers two online options for transfer students seeking an undergraduate degree in criminal justice: a bachelor of arts and a bachelor of science. Each program requires 120 credits, including 60 credits in the foundations of criminal justice. UCF encourages students to participate in internships that can count for up to six credits of upper-level electives. This online criminal justice degree prepares students for positions in law enforcement, criminal justice agencies, and social services. Classes include structure of the criminal justice and legal systems, research methods, criminal profiling, and human trafficking. Full-time faculty design and teach all online courses, using both synchronous classes that meet at fixed times and asynchronous, self-paced formats. Distance learners enjoy access to many support services, including a writing center, career planning, and peer-assisted learning. Applicants to the BA program must demonstrate proficiency in a foreign language equivalent to one year in college, while BS students must hold two years of a high school foreign language. Applicants also need an associate degree from a Florida community college or state school with an overall 2.0 GPA and SAT or ACT scores. With an enrollment of over 54,000 undergraduate and graduate students in 11 schools and colleges, Florida International University ranks among the 10 largest universities in the United States and boasts over 20 years of experience in online learning. Half of its current student body enrolls in at least one online course each year. Florida International University is recognized for its distance learning offerings and high-quality criminal justice programs. The school offers a 120-credit online bachelor of science in criminal justice that prepares students for careers with various agencies in law enforcement and government service, including Immigration and Customs Enforcement, the Department of Homeland Security, and the FBI. Coursework covers the foundations, procedures, and features of criminal justice systems, with electives in areas such as constitutional law, global terrorism, and public policy. Students can earn the online criminal justice bachelor's completely online in a synchronous format delivered through the Blackboard course management system. Students log in at specific times for classes but can usually complete assignments at their convenience. Each student receives a virtual personal coach who provides strategies for online success. The program also assigns distance learners an academic advising coach to help them navigate coursework and graduation requirements. Other support services include online library help, tutoring, financial aid assistance, and career planning. All applicants must submit SAT or ACT scores and official transcripts documenting a GPA of 2.0 or higher. Students transferring fewer than 60 hours from a community or state college must submit college and high school transcripts. The University of South Florida serves a student body of over 50,000 through online and traditional campus-based programs. The school offers an online bachelor of science in applied science (BSAS) with a concentration in criminal justice as a degree-completion program for students with an associate of science degree from a Florida community or state college. This online criminal justice degree does not admit students with an associate of arts degree. The BSAS requires 120 credits, including 24 credits in the criminal justice concentration. Students can transfer up to 60 credits and must hold an overall 2.0 GPA in all coursework presented for transfer credit. The BSAS equips students with the skills needed to enter positions in policing, corrections, law, and the court system, Students must complete two required courses -- survey of the criminal justice system and theories of criminal behavior -- in addition to five electives and a capstone experience that applies knowledge from the program. This fully online program delivers courses asynchronously through the Canvas learning management system, allowing students to access course materials and progress through assignments at their own pace. USF coordinates a variety of technological and tutoring services for distance learners through the university's Learning Commons Online. The College of Criminology and Criminal Justice at Florida State University features an online bachelor's degree in criminology for nontraditional students with an associate degree or students who completed all liberal arts requirements at FSU. Designed as a degree-completion program, this fully online, part-time program works well for students balancing personal and professional responsibilities with their studies. The online criminal justice degree leads to employment opportunities in law enforcement, corrections, security, and social work. Students move through the program at their own pace, taking asynchronous courses through the Blackboard learning management system. Some online courses require the purchase of a course packet that provides students with access to all course materials, including study guides, instructional media, and textbooks. FSU supports distance learners by providing academic advising, tutoring, and technological assistance. While the College of Criminology and Criminal Justice focuses on research and policy, it also maintains a commitment to training law enforcement professionals through its collaboration with the Pat Thomas Law Enforcement Academy. This partnership allows undergraduates to earn their degree at the same time as their state officer certification. Applicants must submit SAT or ACT scores and transcripts from previously attended colleges demonstrating an overall GPA of 2.0 or higher. Depending on the number of transfer credits, distance learners may complete the degree in 3-4 years. Online students may not apply independent living waivers, employee tuition waivers, or funds from the Florida Prepaid College Plan to cover tuition costs. Colorado State University-Global Campus serves nontraditional students and working professionals. Established in 2007 as the first online state university, CSU-Global provides extensive support services to distance learners. In addition to technological, advising, and tutoring resources, the university's support team assists students with health and wellness issues, career guidance, and strategies for finding a work-life balance. CSU-Global's fully online bachelor's in criminal justice and law enforcement administration requires 120 credits, including core courses in policing, research methods, ethics, and crime and deviance. All seniors must complete an integrative capstone course. Professionals working in the criminal justice field may earn credits for their experience through a practicum. This online program allows students to customize their degree by adding one of 20 specializations in areas such as criminal forensics, emergency management, and data analysis. The degree features a self-paced, asynchronous course delivery format with eight-week terms. Distance learners enjoy 24/7 access to courses and instructional material. Distance learners also benefit from CSU-Global's commitment to affordability, and out-of-state students pay the same tuition as Colorado residents. The university's tuition guarantee promises students that their rates will not increase as long as they remain enrolled. CSU-Global charges discounted tuition for active military personnel, veterans, and their families. This online criminal justice degree offers rolling admissions with monthly start dates throughout the academic year. Applicants need at least 12 transferable credits with an overall 2.30 GPA. Students may transfer up to 90 credits from other accredited institutions. Founded in 1766, Rutgers University is the eighth-oldest institution of higher education in the United States. Recognized for its academic excellence and commitment to supporting diversity among its student body, this top-tier public research university serves over 49,000 undergraduates and 20,000 graduate and professional students. Rutgers Online, established in 2015, currently offers 11 full- and part-time distance learning programs, including a bachelor of arts and a bachelor of science in criminal justice designed for transfer students. Applicants need an associate degree in criminal justice or a related field from an accredited community college. Transfer students must meet specific high school prerequisites in English, foreign language, science, and math. Students may complete coursework completely online or in a hybrid format that requires some on-campus attendance. The 120-credit degree prepares graduates for in-demand careers in law enforcement, the legal and criminal justice systems, and social services. Many graduates continue their education in master's programs and law school. The curriculum combines a liberal arts core with preprofessional training in criminal justice. Coursework in the major covers the foundations of theory and practice in criminal justice and criminal law and features distinctive electives that address emerging challenges in the field. While New Jersey residents pay significantly less in tuition than students who reside out of state, Rutgers provides both need- and merit-based scholarships. Over 75% of Rutgers students receive some form of financial assistance, including online students. bachelor of science in criminal justice within the Helms School of Government. Students applying to LU's online programs may transfer up to 90 of the 120 credits required for graduation. Depending on transfer credits, most students finish the degree in under four years. Military service members and veterans may receive transfer credit for military training and experience. LU offers significant tuition discounts to law enforcement professionals, first responders, military personnel, veterans, and their spouses. The university also keeps educational costs affordable by providing distance learners with free electronic textbooks. LU uses rolling admissions, offering eight start dates throughout the year. The fully online criminal justice bachelor's degree features asynchronous courses based on eight-week sessions administered through the Blackboard learning management system. The flexible, self-paced online format appeals to professionals working in law enforcement and criminal justice and other learners who need to manage personal and professional responsibilities along with their studies. Major requirements emphasize the organizational aspects of criminal justice systems, the judicial process, criminal procedure, constitutional law, and ethics. Online learners can choose from several in-demand specializations, including homeland security, strategic intelligence, and crime scene investigation. These specializations enable students to dive deeper into the field through coursework that addresses emerging contemporary issues, such as crisis intervention, counterterrorism, delinquency and juvenile crime, and cyberforensics. A California-based private institution, Brandman University provides educational opportunities for nontraditional learners in 80 academic programs, including a bachelor of arts in criminal justice. Brandman offers this degree both online and in a hybrid format. The fully online option features self-paced and synchronous coursework through the Blackboard platform. The hybrid program combines distance learning with on-campus attendance in evening courses to accommodate working professionals. Applicants need at least 12 transferable credits from an accredited institution with an overall 2.0 GPA or higher. All students pay the same tuition rate, regardless of residency. Long recognized as a military-friendly school, Brandman offers active military, veterans, and their spouses discounted tuition and up to 46 transfer credits for military experience. The 120-credit criminal justice degree equips students with the skills they need to pursue careers in law enforcement, corrections, social services, and emergency management. The 48-credit major requires 30 credits in core courses, including foundations of law, correctional systems, and ethics in criminal justice. Specializations and electives explore contemporary issues, such as forensics, immigration, and national security. Enrollment coaches guide applicants through the enrollment process, sharing information about majors, admissions requirements, and financial aid. Once admitted, online students can participate in virtual workshops to improve their skills in writing, math, and technology. Academic advisers help students navigate coursework and make progress toward graduation. Located in Muncie, Indiana, Ball State University boasts an enrollment of 22,000 in 190 undergraduate majors and 140 graduate programs. One of the first universities in the U.S. to provide distance learning courses, Ball State offers over 70 online degrees that include a bachelor of arts and a bachelor of science in criminal justice. Recognized for its academic quality, Ball State's criminal justice department received programmatic accreditation from the Academy of Criminal Justice Sciences. The 120-credit online criminal justice degree requires students to complete foundational courses in criminal procedures, research methods, data analysis and evaluation, and law and ethics. Seniors must take a capstone course that applies knowledge gained in the classroom to professional experiences. The major also includes 24 credits of upper-level electives that allow students to explore popular areas of study, such as community corrections; juvenile justice; and race, gender, and crime. The degree features a fully asynchronous, self-paced course delivery format, providing flexibility and convenience for students with family or work commitments. Ball State provides an array of student support services to distance learners, including a dedicated online librarian and interlibrary loan access, tutoring, and technological help. Students receive free Microsoft Office software and antivirus protection and a discount on Adobe software. Students may also purchase PCs and Mac computers at a reduced rate. Most students earn the online criminal justice bachelor's degree in four years or less. Students may qualify for transfer credits based on military service, law enforcement training, or work experience in criminal justice fields, reducing the time needed to complete the degree. Sam Houston University, located in Huntsville, Texas, hosts over 21,000 students in eight academic colleges. The school features more than 20 online undergraduate and graduate degrees, including a bachelor of arts and a bachelor of science in criminal justice. The BA requires students to meet a foreign language requirement, while the BS includes additional hours in the social sciences. Graduates enter careers in government, law enforcement, probation and parole, security, and victim advocacy. Both bachelor's programs require 120 credits. The core curriculum consists of 42 credits in the liberal arts and sciences. The remaining credits include foundational courses in criminal law, research methods, and police and correctional systems and practices. Students can choose from 21 credits in popular electives, such as global terrorism, cybercrime, victimology, and forensics. SHSU encourages online criminal justice majors to acquire real-world experience through its internship program that has placed students at INTERPOL, the FBI, and in local law enforcement departments. This program offers distance learners a flexible schedule, delivering asynchronous, self-paced courses through the Blackboard learning management platform. Students may take courses in 16-week semesters in the fall and spring and two condensed, four-week terms in the summer. Students applying to the program with fewer than 12 transferable credits need a minimum 2.5 GPA. Applicants with 18 or more credits from a previous college must demonstrate a minimum 2.0 GPA. SHSU provides over 40 need- and merit-based scholarships for freshmen and transfer students majoring in criminal justice. Based in Norfolk, Virginia, Old Dominion serves a student body of over 24,000 in eight academic colleges and one graduate school. A pioneer in distance learning with over three decades of experience, ODU offers 100 transfer-friendly online programs, including a bachelor of science in criminal justice. This fully online, 120-credit criminal justice program holds curricular roots in sociology with an emphasis on social inequality, diversity, and cross-cultural perspectives. Students earning the degree can apply this academic foundation to internship, service-learning, and practicum experiences. The major consists of foundational coursework in law and the criminal justice system, social research, and criminological theory. All students must complete a capstone research experience in their senior year. Electives allow students to explore emerging areas within criminal justice, such as crime mapping, LGBTQ+ communities and crime, and victimology. Distance learners can earn up to six credits for field experiences or internships that require 50 volunteer hours per credit. The online criminal justice degree prepares graduates for careers in corrections and law enforcement, counseling, and advocacy. Online students can access a career coaching website that provides information on employment possibilities. Other student support services include personalized academic advising and access to DegreeWorks, a virtual tool that keeps track of course requirements and progress toward graduation. ODU participates in a program with the Virginia Community College System to streamline the transfer credit process for degree-completion students. The university grants academic credit for military training and experience and allows active-duty military to take online courses through portable media (e.g., DVD and CD-ROM) while deployed. The University of Oklahoma - Norman Campus enrolls over 31,000 students in 20 colleges. The OU Extended Campus developed online undergraduate and graduate degrees to serve working professionals, veterans and military personnel, and others seeking professional training and degree completion. The fully online bachelor of science in criminal justice offers a fast-paced and flexible program for nontraditional learners. The 120-credit online criminal justice degree requires 30 credits of core courses in comparative justice systems, policing, corrections, the judicial process, and ethics. Students may select one of four concentrations in administrative leadership, homeland security, restorative justice, and investigation and intelligence analysis. Electives cover contemporary issues in criminal justice, including drugs and society, cyberspace security, juvenile delinquency, capital punishment, and human trafficking. Students can transfer up to 60 credits from an accredited four-year institution. At least 30 hours must be taken at OU. Students enrolled in this accelerated BS degree take up to four courses each semester, with five eight-week sessions each academic year. Distance learners may begin their studies at the beginning of any of the five sessions. The program offers all courses in a self-paced, asynchronous format through the Canvas learning platform. Depending on transfer credits, students may finish the degree in 18 months, with most students graduating within 2-3 years. While out-of-state students pay higher tuition rates than Oklahoma residents, the school offers tuition waivers for nonresidents who document affiliation with the armed forces or work experience in law enforcement, corrections, or homeland security. The University of Cincinnati offers 15 online programs through seven schools that serve over 5,400 undergraduate and graduate students. The 100% online bachelor of science degree in criminal justice prepares students for careers in law enforcement, corrections, security, counseling, and social services. This degree also leads to employment opportunities with federal agencies, including the CIA, FBI, and Department of Homeland Security; positions in state and national forest service as park rangers and fish and game wardens; and positions in air transportation security as air marshals or TSA agents. This interdisciplinary program helps students understand the relationship between communities and law enforcement. The curriculum explores issues and challenges in criminal justice through topics such as policing in America; American violence; security and retail loss prevention; and race, class, and crime. Open to freshmen and transfer students, the online criminal justice degree offers start dates in the fall, spring, and summer semesters. Freshmen applicants must submit high school transcripts and SAT or ACT scores. Transfer students need 24 credits with a cumulative GPA of 2.0 or higher. Most distance learners complete degree requirements within four years. The school provides several support services for students through its One Stop Student Service Center and Catalyst Portal, including information about financial aid, enrollment, billing, and academic records. The University of North Texas offers several online undergraduate, graduate, and certificate programs that allow students to balance school with work and family obligations. Students may complete the asynchronous, fully online bachelor of science in criminal justice degree on a full- or part-time basis. In some cases, online learners may receive transfer credit for military service or professional training. Students can also apply for need- and merit-based scholarships. The 120-credit online criminal justice bachelor's degree requires 27 credits in foundational courses that address central issues, such as criminal law, diversity, and public policy. The interdisciplinary curriculum requires 12 credits in psychology, sociology, communication, and technical writing. Distance learners also complete 15 elective credits that explore emerging topics, such as cybercrime, terrorism, and serial homicide. The department maintains relationships with criminal justice agencies that facilitate internship and field placement opportunities. A unique feature of the program encourages online students to participate in short-term study abroad opportunities. Distance learners can access many resources and support services. Academic advisers help students register for classes and stay on track toward graduation. The Career Center sets up internships and field placements and provides career guidance. The Learning Center provides learners with techniques and tips for a successful academic experience through workshops on time management, study skills, and speed reading. Established in 1890 as a land-grant university, Washington State University has expanded its mission to include educational access for nontraditional students through its Global Campus program. The Global Campus offers 12 undergraduate and nine graduate degrees, including a bachelor of arts in criminal justice. This 120-credit, fully online criminal justice degree prepares graduates for leadership roles in law enforcement, the court system, and social services. The major requires 18 credits in core criminal justice areas, including policy, procedures, and research methods and quantitative analysis. Students must take nine credits that explore the structure of contemporary police, correctional, and judiciary institutions. Students choose from electives in specialized topics, such as criminal justice in a multicultural society, juvenile corrections, and violence toward women. Seniors complete a capstone seminar that addresses ethical issues. The school participates in direct transfer agreements with community colleges in Washington. These agreements ensure a seamless transfer of credits from an accredited associate degree. Transfer students with less than one academic year of college credit must enter the program as freshmen. WSU offers 24/7 assistance to help students navigate the Blackboard learning management platform. Online learners enjoy access to the same support services as on-campus students, including academic advising, mentoring, and tutoring. All students receive a free subscription to Microsoft Office 365. Kansas-based Fort Hays State University serves a student body of 14,000, with over 6,000 students enrolled in distance learning courses through the FHSU Virtual College. The Virtual College administers over 40 online associate, bachelor's, and graduate programs, including two options for undergraduate criminal justice degrees: a bachelor of arts and a bachelor of science. While both degrees require 120 credits, the BA requires 10 foreign language credits while the BS does not. The program features asynchronous coursework and synchronous classes that meet at specific times using the Blackboard learning management system. Students in both degrees take the same 24-credit core that combines an academic focus on theory, ethics, and research with practical coursework that teaches technical writing and explores criminal justice systems and careers. Students choose at least one elective from three subareas: policing, offenders and victims, and criminology. All students complete a culminating seminar in criminal justice that focuses on research, conflicting viewpoints, and critical analysis. The program emphasizes cross-cultural judicial practices, offering internships that enable students to study criminal justice systems and correctional practices abroad. This online criminal justice degree prepares students for professional roles in law enforcement and corrections, the court system, private security, and social services. Graduates can enter careers with federal agencies, such as the FBI, the TSA, and the Department of Homeland Security. FHSU offers credit for prior learning, work, community service, and other experiences. Members of the armed services may receive credit for work and training performed while on active duty. The University of Massachusetts-Lowell offers over 50 online degree and certificate programs. Nationally recognized for its high-quality criminal justice programs, UMass Lowell delivers its 120-credit bachelor of science in criminal justice as an online or hybrid program through the Division of Online and Continuing Education. UMass Lowell features an open enrollment policy that allows anyone with a high school diploma or GED to enroll in a degree or certificate program. Applicants to distance learning programs with prior credits may transfer up to 90 credits toward their bachelor's degree, including up to 68 credits from a community college or two-year institution. The online criminal justice bachelor's degree requires 15 credits in foundational topics, such as policing, corrections, criminology, and law. A unique feature of this program is its emphasis on research methods and data analysis with applications to crime mapping. The program invites students to explore their interests through 18 elective credits that address current issues and challenges in criminal justice, such as global and domestic terrorism, hate crimes, intimate partner violence, and victimology. UMass Lowell allows students to complete a combined bachelor's and master's degree. This accelerated degree counts two graduate classes toward the credits required for the BS and MA degrees. Arizona State University-Skysong offers over 100 online degrees, including its nationally recognized bachelor of science in criminology and criminal justice. This 120-credit online degree consists of 40 classes offered in 7.5-week terms. The Fast Track option allows students to complete all requirements in 26-30 months. The program combines an emphasis on research and analytic skills with professional training that prepares students for careers in law enforcement, corrections, the court system, and corporate security. Many graduates enroll in law school or graduate programs in criminal justice or related social science fields. The curriculum invites students to explore every aspect of contemporary criminal justice, including domestic violence; gangs; white-collar crime; and gender, race, and crime. The major requires a culminating solutions-based learning course that integrates academic knowledge with real-world applications. The program also encourages internships that help students acquire professional, real-world experience before they enter the job market. This online criminal justice degree combines asynchronous and synchronous courses using the Blackboard learning platform. Distance learners can access 24/7 technology assistance and receive the same student support services as campus-based students. The school offers the same tuition rate to all students regardless of residency, accepts up to 64 transfer credits from community colleges, and guarantees admission to transfer students who earned an associate degree with a minimum 2.0 GPA. The school offers six start dates throughout the year. A Christian school that welcomes students from all faiths, Central Methodist University values liberal arts education as the foundation for professional training. CMU's College of Graduate and Extended Studies (CGES) reflects this mission by offering convenient distance learning and off-campus programs to over 4,000 students, including an online bachelor of arts and an online bachelor of science in criminal justice. The BA and BS degrees each require 120 credits, delivering synchronous courses in eight-week terms. Students in the BA program complete 6-8 credits in a foreign language, while the BS degree requires 6-8 credits in analytical skills that students choose from courses in computer applications, logic, research methodology, and math. The online criminal justice degree allows students to take electives that prepare them for careers in law enforcement and management, fraud examination, criminal investigation, and profiling. The major requires a research-based capstone course in addition to core foundations in criminal behavior, criminal law and procedures, and criminal justice systems. Distance learners enjoy access to a full range of student support resources, including academic advising, technological help, and career planning and job placement. Students may enroll in CGES criminal justice programs without prior college credits, although most students transfer credits from community colleges. The university hosts transfer articulation agreements with public community colleges in Missouri and surrounding states to help students seamlessly transfer credits. CSUSB hosts over 20,000 students. The school's College of Extended Learning offers several online degree completion programs for nontraditional students, including a bachelor of arts in criminal justice. This program prepares students for careers in law enforcement, social services, and the court system while providing a strong foundation for graduate work. Designed for working professionals who completed general education requirements with a minimum 2.7 GPA, this program accepts up to 60 semester credits from a community college or regionally accredited university. Applicants must also complete two prerequisites courses: introduction to the criminal justice system and criminal law. New students may start the program at multiple times throughout the academic year. The fully online, asynchronous course delivery format allows distance learners to proceed through degree requirements at their own pace. This online criminal justice degree emphasizes an interdisciplinary approach that connects theory and research inquiry with professional applications. The major requires a course on expository writing for the social sciences and an interdisciplinary capstone seminar on race and racism. Students take core courses in theory, methods, statistics, and police systems in addition to an integrative studies seminar on major issues in criminal justice. Electives in areas such as domestic violence, juvenile justice, and environmental crime provide students with an understanding of the contemporary challenges in the field. Distance learners at CSUSB enjoy the same student support services as campus-based students, including access to the writing center and technological help. Located in Albany, New York, Excelsior College features more than 30 online degree completion programs for nontraditional learners, including a 120-credit bachelor of science in criminal justice. Known for its generous transfer policies, Excelsior provides pathways to help students finish their degrees as quickly as possible. The college awards transfer credit for most courses completed with a grade of C- or above and also awards credit for professional and military experience. Excelsior's online criminal justice program requires 33 credits in the major. Core courses provide students with foundation knowledge in law enforcement, criminal justice administration, criminological theory, and research methodology, culminating with a three-credit capstone experience. Students also complete 15 general elective credits or the homeland security concentration, which focuses on themes such as domestic and international terrorism, counterterrorism, emergency management, and infrastructure security and policy. Course terms span eight or 15 weeks, with multiple start dates throughout the academic year. Students take synchronous courses taught by faculty with graduate degrees. Excelsior provides a full range of resources for online students, including writing support, library resources, technical help, and career guidance and placement. Distance learners receive personalized support from academic advisers and success coaches to keep them on track toward graduation. A member of the University of North Carolina System, Western Carolina University serves over 11,000 students in 15 undergraduate and 40 graduate programs, including an online bachelor of science in criminal justice. Applicants to WCU's criminal justice program must fulfill rigorous entrance requirements. Students need an associate degree from an accredited community college and one year of work experience in criminal justice or a related field. The 120-credit online criminal justice degree requires 18 credits in core topics. The curriculum exposes students to emerging trends and challenges in criminal justice, such as geographic information systems; cybercrime; homeland security; and minorities, crime, and social policy. Distance learners may pursue internships to acquire real-world professional experience. Graduates find employment in law enforcement administration, policing and corrections, emergency services, and other settings. The curriculum emphasizes comparative and international perspectives in criminal justice, encouraging students to pursue study abroad opportunities for credit. The school uses the Blackboard learning management platform to deliver synchronous and asynchronous formats. Online students can request academic assistance from the Brainfuse HelpNow tutoring service, the Writing and Learning Commons, and the Math Tutoring Center. The bachelor of science in criminology and criminal justice at Missouri State University-Springfield combines foundational courses in policing, corrections, law, and the courts with practical training and explorations of contemporary issues. Distance learners can move through this fully online program at their own pace, taking asynchronous classes through the Blackboard learning platform. Students can access technical support and student support services, including advising, financial aid assistance, and career planning. The 125-credit online criminal justice degree requires 45 credits in the major, including a mandatory capstone course for seniors that integrates knowledge from coursework into a research project. A distinctive feature of the curriculum is its emphasis on emerging concerns, with electives that focus on topics such as serial killers, aggressive and delinquent females, environmental terrorism, and marijuana legalization. The curriculum integrates academic preparation with practical applications. Distance learners may take a course on criminal justice careers that provides useful information on career prospects, the job search process, and options for graduate work. Students may receive academic credit for service learning by participating in community service through a community agency or public service provider. Distance learners may also pursue internships in criminal justice settings that prepare them for professional roles. MSU charges the same online tuition rate for all distance learners regardless of residency. The admission process for freshmen applicants considers GPA, class rank, and standardized test scores. Transfer students need a minimum of 24 credits with an overall GPA of 2.0 or above. Located in Fort Myers, Florida Gulf Coast University offers a hybrid bachelor of science in criminal justice that requires applicants to hold an associate degree from an accredited Florida community college. The program involves completion of 60 upper-division credits through FGCU. Distance learners complete most courses online through the Canvas learning management system. The program mixes synchronous and asynchronous formats, with some discussion sections requiring attendance on the FGCU campus. The bachelor of science degree presents a balanced criminal justice perspective, emphasizing relationships between victims, offenders, the criminal justice system, and society. Online learners take 36 credits in core courses that cover research methods, crime data analysis, policing and corrections, and the judiciary system. Students may specialize in one of six concentrations: law enforcement, corrections, legal studies, juvenile justice, international justice, or management in criminal justice. The degree requires students to complete an internship for a maximum of six credits. Each internship credit requires 75 hours of work at the placement site. Approved by the department, placements might involve law enforcement agencies, law firms, and government bureaus. Some students serve as research assistants for faculty members. While completing their internship, students must participate in a course that meets both on campus and virtually. A private, interdenominational Christian institution located in Virginia Beach, Regent University offers 30 undergraduate online programs. The school's 120-credit online bachelor of science in criminal justice consists of 49 general education credits, 30 criminal justice credits, 23 elective credits, and 12 concentration credits. The program offers concentrations in corrections, homeland security, and law enforcement. Students can also choose an individualized option that allows them to focus on coursework that reflects their interests and goals. All students must complete a senior seminar that requires them to design, conduct, and present a research project. Students pursuing the online criminal justice bachelor's degree complete most courses asynchronously or in an accelerated format using the Blackboard learning platform. Some courses use synchronous components, requiring students to log on for lectures, discussions, or group work at a scheduled time. Courses run in eight- or 15-week terms with multiple start dates throughout the academic year. Regent offers a generous transfer policy, allowing students to transfer up to 90 credits toward their undergraduate degree. Regent offers distance learners the same support as on-campus students. Students can take advantage of technology help, online library resources, academic advisers, and success coaches to help them navigate degree requirements. Regent's Office of Career and Talent Management provides personalized career assessments and planning. Susan Bourke is an associate professor and director of undergraduate studies at the University of Cincinnati. Prior to joining the faculty, Professor Bourke worked for the Kentucky Cabinet for Juvenile Justice as a juvenile counselor, was a juvenile court probation officer, and served as an administrator for the Kenton County Juvenile Court. Her area of expertise is corrections, particularly juvenile justice. Currently, she is the director of undergraduate studies for the School of Criminal Justice. Why did you choose to teach criminal justice? Was this a field you were always interested in? I knew I wanted to work in the criminal justice field since high school, maybe even sooner. When I graduated from Eastern Kentucky University with my double major in criminal justice and social work, I acquired my first job with the State of Kentucky Office of Juvenile Justice (formerly the Cabinet for Human Services). I worked as a school counselor at a special school for truant youth and youth experiencing challenges in school. I then became a probation officer with the Kenton County Juvenile Court in Kentucky. After 12 years working with the state of Kentucky with juvenile offenders, I was invited to teach criminal justice at the University of Cincinnati. I earned my graduate degree in criminal justice at the University of Cincinnati and realized that teaching undergraduate students was my new career passion! I have now been teaching our criminal justice undergraduates for over 30 years and continue to enjoy it. What skills do you teach that graduates are able to apply to their work on a day-to-day basis? I am a “practitioner” turned “teacher.” I worked “in the field” for 12 years in the criminal justice system, more specifically in the juvenile justice system. I worked with youthful offenders and their families. In my daily experiences, I connected with all facets of the justice system: police, courts, and corrections. I learned that integrity, people skills, and a comprehensive knowledge of the justice system were essential to my success. I had to listen to what people said, understand where they were coming from, think critically about each situation, and solve problems. I had to be a good communicator, both verbally and in writing. In all of my classes, I hope students learn as much as they can academically. I stress that “an education is the greatest gift that you give yourself!” From the very start of the college experience, I urge students to begin preparing their resumes. I encourage every student to read all that they can, participate in all of their classes, and take advantage of every opportunity available to them. I highly suggest that each student get work experience with a part-time job in the criminal justice field while in college. I advise all students to become actively involved in an organization that interests them, either on campus or within their community. I recommend that students complete a significant number of hours of community service. All of this will accumulate into a very impressive resume upon graduation. It will also provide the “real-world” skills employers are seeking. Do your bachelor's degree students typically complete an internship or other form of field experience? If so, what are the different ways that it can impact a student's desire to work in criminal justice? The on-campus students are required to complete a criminal justice field experience/internship as their senior year capstone experience. Our online students complete a research paper as their required capstone experience. Because students must be supervised at the internship in coordination with the Field Placement instructor, it does not serve the student well from a distance. I highly recommend that online students seek internship opportunities within their communities or with specific criminal justice agencies. These individual internship experiences will allow a student to know whether this career is what they hope to do in the future or let the student know this career is NOT what they want to do in the future. A criminal justice part- or full-time job or internship is invaluable for our students. What are some of the challenges you face in teaching criminal justice? There are a couple of challenges I have found in teaching criminal justice. First, many students have an unrealistic view of the criminal justice field because of the Hollywood movies and television shows they watch. The idea that a police office can retrieve a criminal’s matched fingerprint in a database from the officer’s cell phone in a matter of seconds...is unrealistic! The idea that a career criminal can be “cured” by learning to “line-dance” with fellow prison inmates…is unrealistic! Second, many criminal justice students are unaware of all of the amazing careers within criminal justice. Unfortunately, crime and criminals are everywhere. There are traditional careers in policing, the courts, and corrections. But there are many different career opportunities in the business sector, retail, cybersecurity, banking, etc. I believe it is our responsibility to introduce these career paths to our students. It is up to students to investigate these careers and develop a sustainable career plan. Third, technology has replaced old-fashioned critical thinking and problem solving. Why think about something when you can “Google” it? How has today's charged political climate impacted your teaching/classes? What a wonderful period of time when students can actively engage in discussion and critically think about their beliefs. They must be given the opportunity to listen to ideas from all sides of the discussion and learn. I spend a great deal of time in my classes discussing the history of the U.S. Constitution and how our government was formed. The Constitution created the three branches of our government, which have impacted our criminal justice system. The political climate surrounding law enforcement has been unfortunate. There are so many incredibly wonderful people working in law enforcement. They protect our communities and keep us safe. In the past few years, many of our best and brightest have chosen a career in policing. One student, in particular, graduated with a bachelor’s degree in criminal justice. He earned a 4.0 GPA and spent at least two years tutoring struggling third-graders who must pass the required state reading test. He could have been a doctor, an engineer, a businessman, or chosen any other career…but is extremely proud to be a Cincinnati police officer. What advice would you give to students who are considering a degree in criminal justice? I would highly encourage students to follow their dreams. If a career in criminal justice is what they are passionate about… do it! A criminal justice degree is a professional degree that allows for so many interesting job opportunities. An online criminal justice bachelor degree offers a broad and multidisciplinary education for learners who seek to pursue a career in the study of law or in law enforcement. Fulfilling the minimum educational requirement for the vast majority of jobs in this field, an online criminal justice degree covers an array of topics fundamental to the field. However, advanced coursework may deviate depending on the specific mission of a program and/or the interests of the faculty involved. This guide aims to provide an excellent starting point for future professionals hunting for the best criminal justice degree program for their needs. The sample of general coursework below exemplifies topics typically covered in criminal justice programs at this level. Variations and differences in advanced course areas depend on the history and overall goal of specific schools and departments. Introduction to Criminal Justice: A fundamental class for all online criminal justice degree programs (and usually a prerequisite to more advanced coursework), this course provides students with a philosophical and historical framework for the processes and functions in the American criminal justice system. Students also begin to learn about more complex topics like social control systems and comparative justice, preparing them for entry-level positions in the field or further education. Ethics and Diversity: Essential for learners interested in law enforcement or victim advocacy, this course examines ethical considerations within the criminal justice system, including its advantages and shortcomings. Students also use this information to craft their own code of conduct in relation to external structures, like the legal system and cultural and ethnic nuances. Law and Court Procedures: This course teaches students the practical ins and outs of the legal system in the United States, including the process for detention, arrest, and all the steps of a trial. This course and its more advanced counterparts are essential to those who intend to work in criminal courts as, for example, legal assistants or courtroom advisers. All criminal justice online schools that offer a bachelor's degree require their students to complete at least 120 credits in order to graduate, which takes approximately four years for those enrolled full-time. The curriculum generally consists of a combination of general education, core major requirements, and select electives. Students may choose to enroll in a program that allows them to complete their full tenure completely online or through a hybrid structure. However, many programs require students to have completed previous college credits either at their home institution or at another school before they enroll in the program or they officially declare a criminal justice major. Before applying for any online criminal justice programs, students should take the time to research each potential university's specific academic requirements and transfer policies. For example, some schools employ more of a cohort curricular model, enabling students to advance through their degree with the same group of people — and therefore building a sense of community and peer support. Most, however, allow students to learn on their own individual terms and schedules, recognizing the need for the flexibility this allows. When considering schools for application, students should seek out criminal justice degree online programs accredited both nationally and regionally. National recognition by the United States Department of Education and/or the Council for Higher Education Accreditation means that the school meets (and continues to meet, since they must seek reapproval every three to five years) the overarching national standards for an institution of higher education. Regional accreditation from the seven recognized bodies means that the school meets a related but distinct set of standards established by a state or group of states. Both are important for academic and professional advancement. However, it's important to highlight that regional accreditation is more stringent. Nationally recognized schools will accept college work from any regionally accredited school, while the opposite is not always true unless a school has both markers of quality. A third level of accreditation also exists, the industry/field standard. While not as important as the other two levels of accreditation, future criminal justice professionals may also want to check to see if their program is recognized by the Academy of Criminal Justice Sciences (ACJS). Only a handful of programs work under the ACJS umbrella. The United States Department of Education (USDOE) and the Council for Higher Education Accreditation (CHEA) both provide national accreditation to ensure that colleges and universities meet general standards and learning outcomes for the degrees they offer. Most online colleges for criminal justice have both stamps of approval. The former, unsurprisingly, is a government organization, while the latter is non-government body. The two usually work together to ensure a ubiquitous set of checks and balances, and the duo also sets standards that regional accreditation organizations, such as the New England Association of Schools and Colleges and the Middle States Commission on Higher Education, must meet in order to maintain their authority. Lists of the colleges and universities under the auspices of the DOE and CHEA are available at their respective websites. A recent ranking by Pucker Mob listed 'criminal justice' as one of the best college majors for job placement, citing a 4.7% unemployment rate for all degree-holders in this field. However, the unemployment rate for criminal justice job candidates will depend on the amount of professional experience they have gained in addition to their undergraduate studies. A recent survey from Georgetown University's Center on Education and the Workforce (CEW) includes unemployment rates for different college majors. Using findings from that survey, the following table includes unemployment rates for 'criminal justice and fire protection' bachelor's degree-holders over the last three years of available data. As the table shows, the unemployment rate for criminal justice degree-holders is significantly lower for individuals with professional experience. It's also important to note that the unemployment rate for experienced degree-holders was actually lower than the rate for inexperienced individuals with a master's degree in criminal justice (4.4% to 4.6%), and only slightly higher than the rate for experienced master's degree-holders (3.3% to 4.0%). A bachelor's degree is generally considered the strongest investment for individuals who plan to pursue a career in criminal justice. Bachelor's degree-holders in this field outearn associate degree-holders by a strong margin.The following table explores salary expectations for employees with an associate in criminal justice. As the table reveals, employees with a bachelor's in criminal justice outearn those with an associate degree by roughly 13%. However, the salary for graduates with a bachelor's in criminal justice will vary by their chosen career path. The next table explores expected earnings at four career benchmarks for some of the most common professions for criminal justice majors. Of the five professions listed above, criminal justice and law enforcement teachers enjoy the highest career salary growth: roughly 38% between the entry-level and late-career benchmarks. The other four professions also experience strong salary growth throughout their careers ― roughly 25% to 30%. Students who graduate with an online bachelor's in criminal justice will be qualified for dozens of positions in law and law enforcement. Four of the most common career pathways for these degree recipients are detailed below. Police and Detectives: Police officers and detectives are responsible for bolstering public safety and protecting human lives, property and natural resources. They also investigate crimes, collect evidence and arrest perpetrators of crimes; they often testify in court proceedings, as well. Other day-to-day duties include patrolling by car or on foot, writing police reports and obtaining different types of warrants. Paralegals and Legal Assistants: These professionals act as supportive staff for practicing attorneys. Their job includes researching case studies, writing legal documents, requesting affidavits and preparing lawyers for trials and court appearances. Paralegals and legal assistants are also responsible for maintaining detailed client records, and must be skilled at legal database software that allows them to keep their records organized and up-to-date. Forensic Science Technicians: These technicians gather physical evidence and analyze their findings in order to help investigators solve crimes. Their duties are largely compartmentalized to two locations: crime scenes and laboratories. They must be adept at identifying various types of evidence and utilizing different tools and lab equipment. Probation Officers and Correctional Treatment Specialists: Probation officers and correctional treatment specialists work with probationers, or individuals who have already been convicted of a crime. They meet with probationers on a regular basis to administer drug tests and discuss post-incarceration options, such as employment or higher education. They also monitor probationer activities to help ensure they do not reoffend, or commit more crimes. Making professional connections and learning about different approaches to criminal justice is crucial to your success. Professional organizations offer a great entry point for students who want to learn more about their chosen career path. Below you'll find three of the country's most prominent organizations established for physician's assistants. These organizations host networking events, provide online trainings, maintain active job boards, and offer other services for career-ready college graduates. National Association of Police Organizations: NAPO was founded in 1978, and today represents roughly 241,000 officers and detectives in more than 1,000 law enforcement units. Members receive invitations to three annual conferences, as well as continuing education opportunities. National Association of Legal Assistants: NALA is a nonprofit organization representing more than 18,000 paralegals, both individual members and employees of member affiliates. The association offers two certifications for paralegals, as well as online webinars, job leads and complimentary issues of the Facts & Findings academic journal. Larissa Nonni graduated with a bachelor's degree in criminal justice in 2009 from Monroe College in New Rochelle, NY. She is currently in her third year of law school and works at an immigration law firm. How did your criminal justice bachelor's degree help prepare you for your career and for law school? Well, since high school I wanted to be an attorney but I didn't want to do criminal law because I just felt like it was too cliché. So I pursued criminal justice because I wanted to understand the law enforcement side before I looked into the law side. In that regard, it helped me be more aware of the law enforcement side of things, and now in law school I realize how they both intertwine and how they need one another and play off of each other. This includes how in a criminal case, a problematic arrest can destroy a case, how someone's environment plays a real role in their upbringing, especially when looking at criminal cases, and how as prosecutors, understanding that can give you a greater power in how to help defendants and what plea deals would be more beneficial to society. What types of skills did you develop in your criminal justice bachelor's program? I would say psychological skills. I had criminology and victimology and those two classes were really helpful in understanding people in general, which goes back to the effects of environment in upbringing and how that affects people's choices later on in life when it relates to crime. Also, my criminal justice program helped me develop my critical thinking skills. When you study these subjects, your way of thinking changes because you see people differently, which really helps me in my job now; I am able to look at different components and see how they played a bigger role in what we are dealing with today. What advice would you give to bachelor's graduates seeking a career in the field of criminal justice? I would say that now-a-days, a bachelor's is not enough if you want higher-up jobs. Make sure you research what you are really interested in in the field so that you know whether you will need to get a master's after and if it's really worth it to you. The job market is available for those that research and go after it.